Leaving the lifts behind sounds romantic. No crowds, no rules and fresh snow! There’s no question that skiing freely on ungroomed powder away from the ski areas is like a dream come true, but the reality has its challenges. 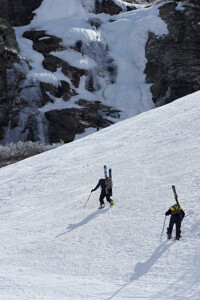 Avoid backcountry skiing when the avalanche forecast is high or extreme. An avalanche transceiver should be worn when skiing in areas with avalanche hazards. If you were buried in an avalanche, they can be switched on to help rescuers find your location. 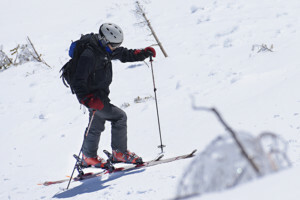 When in uphill mode, the skier has the binding’s heel lifters raised to make the steep uphill less of a strain on the back of his legs and to level his feet on the incline. Once the climb is done, everything will lock into downhill mode for the run down. 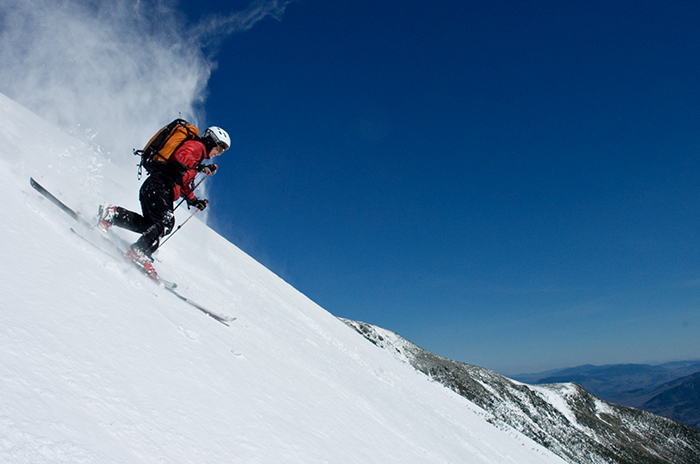 The biggest trend in skiing has many names: backcountry skiing, alpine touring, randonnée, off-piste, earn your turns, ski mountaineering, split boarding or ski mo. But whatever you call it, skiing and riding down slopes you’ve just climbed up is a rapidly growing aspect of winter outdoor sports. Proponents cite the additional level of adventure and exercise as lures, but one crucial thing fueling the surge is simply better equipment. 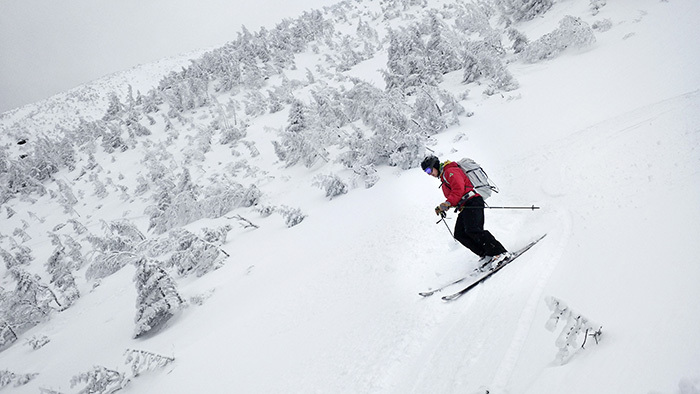 Ski and board equipment has been evolving ever since the 19th century when artisans in Telemark, Norway, invented the cambered ski, arched to more evenly distribute the skier’s weight. The newest gear is much lighter to lug, but still able to let you ski things that, not long ago, required heavier and less versatile equipment to tackle. Snowboarders, who were latecomers (and early disrupters) to the classic ski slopes, are also eagerly taking on the backcountry. They can either tote their boards and hike up, or can now purchase split boards that separate into two parts. This allows them to use a ski-like motion for “skinning” the uphill, then reconfigure back into a snowboard for the ride down. 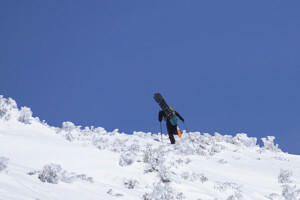 Such advances allow skiers and snowboarders to more comfortably head out on their own and leave the lifts behind. But not too far behind, since ski areas are jumping on board to provide convenient spots where their clients can give it a try and still wind up at their lodge for après-ski comforts and conversation. Two skiers evaluate the conditions and consider route options in front of the impressive headwall of Tuckerman Ravine on Mt. Washington. This ease of access to the backcountry experience can be a great way to see if it’s for you, but remember, ski areas do a remarkable job making and grooming snow and on some days, out in the backcountry you’ll miss that work. 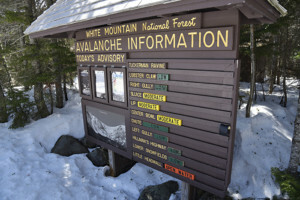 Most importantly, the risk management system at a ski area is considerable, a benefit that’s often taken for granted. Barriers, padding and warning signs are all backed up by a trained and well-positioned ski patrol. All of that never seems important until you hit that hidden ice, catch an edge or blow a turn. Such a risk management system is, at best, less robust or altogether not available in the backcountry. Learn what it's like to ski the Gulf of Slides with a first-person account. See the story here. If you are just starting to contemplate the sport, your first question might be how does it work? 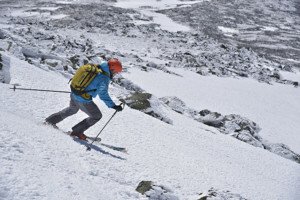 Typically, the climbing is done with your skis still on in a process called skinning — a name that comes from back in the day before lifts, when skiers would slip seal-skin “shoes” over their blades to provide traction on uphill climbs. Why seal skins? To help seals navigate powerfully in the water, their stiff fur evolved to be smooth in one direction and rough in the other. 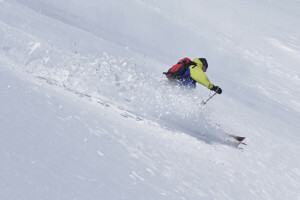 This same quality allows a “skinned” ski to slide forward easily but resist slipping back. New fabrics have improved upon that natural traction. Today, most climbing skins are made of nylon, with some made from mohair. The skin has an adhesive that sticks it securely to the base of the ski. 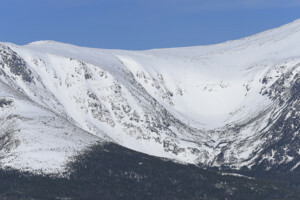 Four skiers ascending the Gulf of Slides on Mt. Washington. Though it’s certainly possible to skin up slopes like this with the skis on your feet, these skiers chose to “boot” up instead. 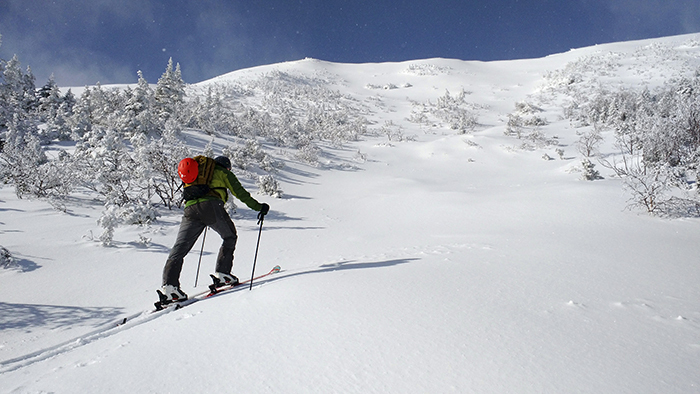 Bindings for backcountry skiing have two modes: heel locked down for the descent and the heel unlocked for the climb. The boots do not bend; instead, they pivot in the binding. 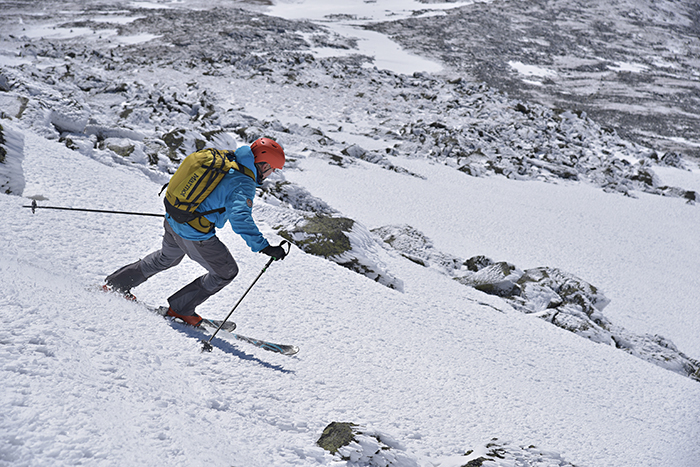 When the heel is locked down, the binding feels just like a regular downhill binding, but the boots convert to a walk mode that makes walking feel more natural. 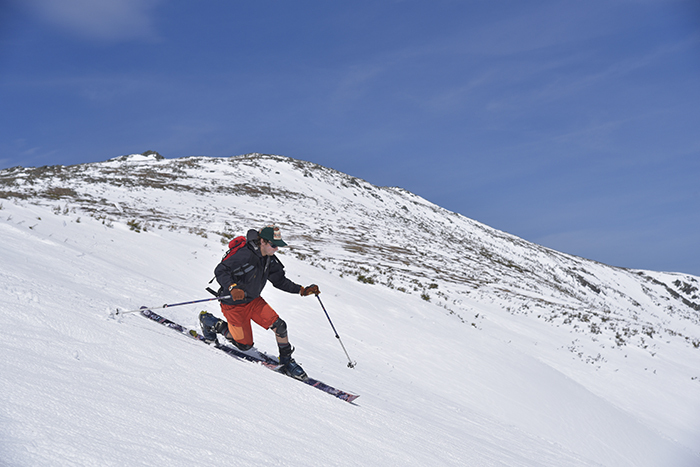 There are a number of companies, styles and choices for skiers seeking the right balance of support and downhill performance, weight and climbing comfort. The one piece of equipment that might seem the most unchanged is the ski itself. Its technology is hidden in the new materials they use, but the improved performance they offer paired with their light weight gives some insight into their sophistication. The choices are abundant and a bit confusing unless you’re a pro, so to choose your own best brands and styles, go to a ski shop that specializes in backcountry skiing and riding. If you want to give it a try without a huge investment, rentals are available. 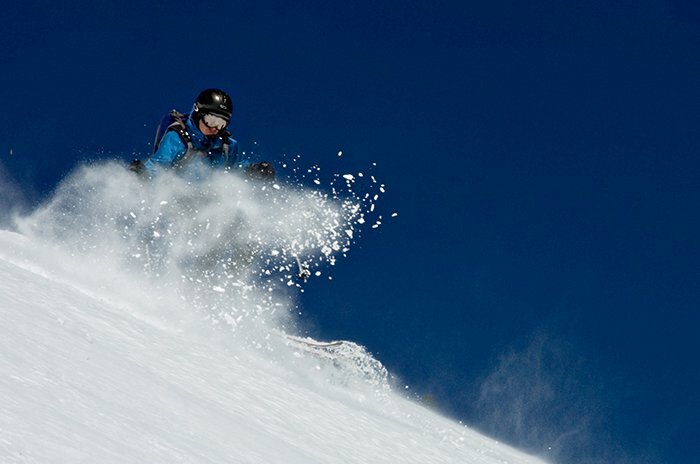 But whether you are just sticking a toe into the backcountry scene or going full bore, be sure to start easy. 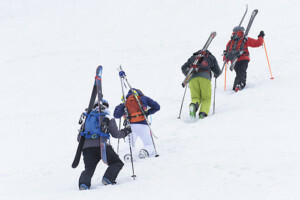 All the challenges of skiing — poor snow, obstacles and avalanches — are intensified away from the slopes, and emergencies are often costly learning experiences. With more ski areas getting into the uphill ski business, there are plenty of places to test your skills and determination. 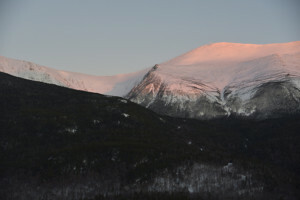 Crowds of backcountry skiers in the AMC Pinkham Notch Camp overflow parking lots are a common sight during April weekends. Located at the base of Mt. Washington, this is the most popular and traditional access for skiing on the mountain. 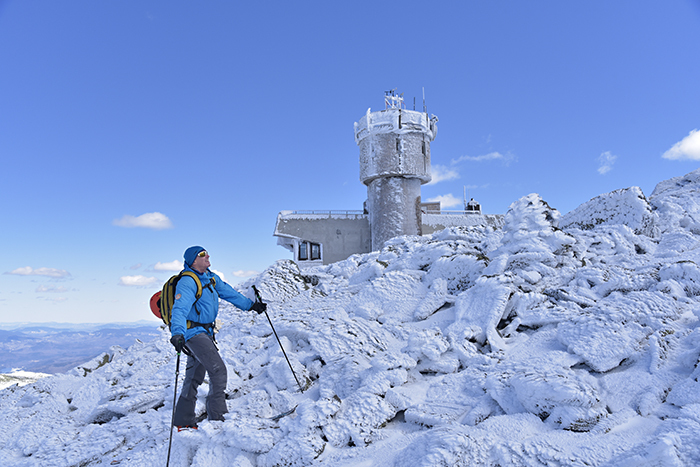 With your equipment needs addressed, living in New Hampshire means you likely have only a short drive to a ski area with an uphill policy to allow for skinning their slopes (many do, but check first). 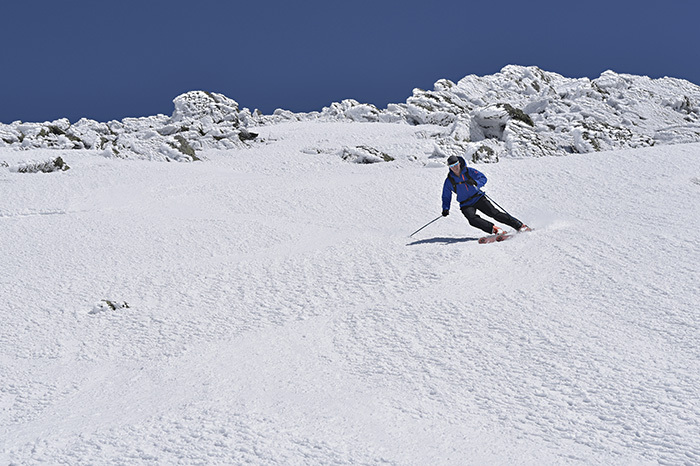 Using that ski area as a training ground will help you get used to skiing after a long uphill, teach you about the skin’s ability to climb, get your boots broken in a bit and get you used to the transition from skinning to skiing. 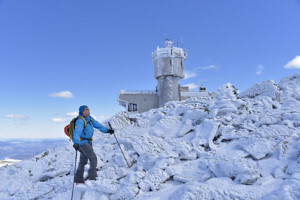 With the increase in the popularity of the sport, organizations are springing up to revive old trails and develop new areas — the largest of these in the state is the Granite Backcountry Alliance. 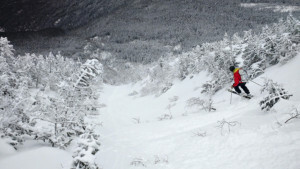 Developing a modern backcountry ski area focuses less on trails and more on thinning out hillsides to create glades. 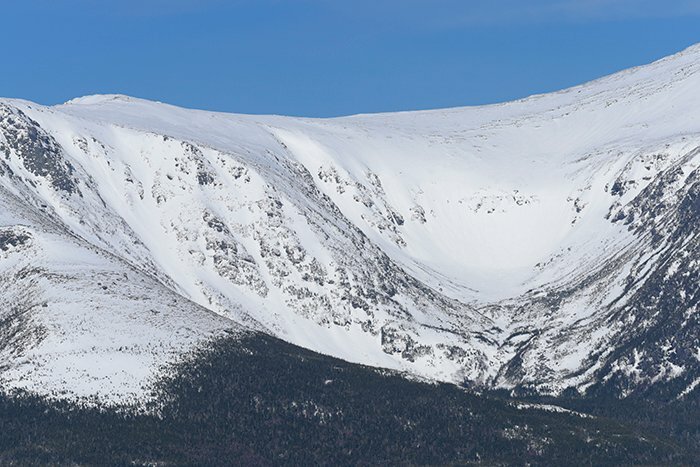 There are natural glade areas all over the state as well, and as you meet more people and get into a community of backcountry skiers, they will introduce you to the natural glades in your area. All these trails and glades have their own challenges and skiing them will teach you quite a bit. Remember that there are no pre-positioned ski patrols out in the wild, so being conservative and skiing with a partner is important. The avalanche is the bête noire of backcountry skiing. You can’t get too far into a discussion on the topic without mentioning this enigmatic hazard. This article isn’t the place to learn how to cope — that should take place with an expert in the field — but your first goal should be to avoid the risk as much as possible. 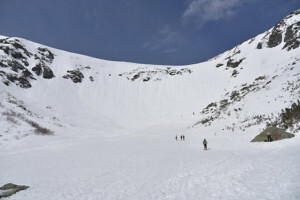 First, avoid any backcountry skiing when the avalanche forecast is high or extreme. Fortunately, those days are rare, but they occur during or shortly after a big snowstorm when the temptation is the highest. Those elevated ratings usually do not last very long, so there will be plenty of snow left away from the ski areas when the hazard drops. 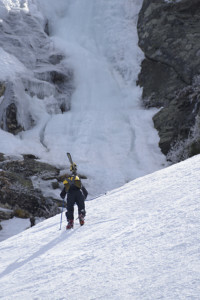 A skier on the Lobster Claw Gully in Tuckerman Ravine. To the left in the background is the headwall. When you skin up to the Gulf of Slides and imagine the pleasures of the descent, you’ll be tempted to go higher on the headwall. Just remember, it isn’t called Gulf of Slides for nothing. To go higher, it helps to have a hiking background and some snow and ice climbing skills. 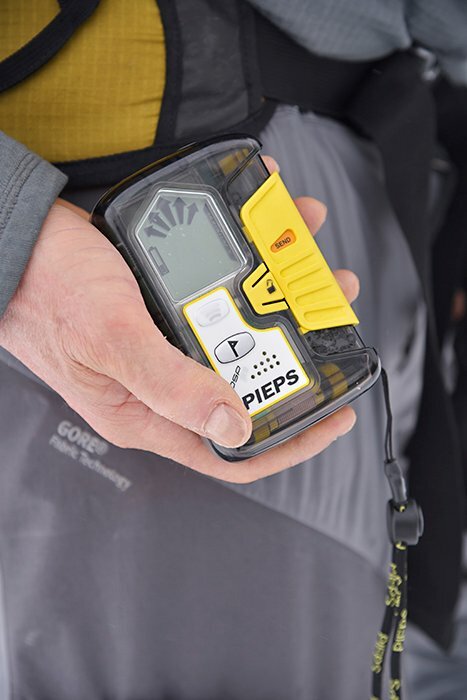 You don’t need strong technical climbing skills, but you should be comfortable in the use of crampons and ice ax, and you need to take an avalanche course and obtain avalanche rescue equipment. Skiing in the backcountry should always be done with a partner, but skiing in avalanche terrain makes that doubly true. Should something happen, it’s your partner you will rely on to find you and dig you out, and snow softened by a trapped skier refreezes in about 15 minutes. If you want good partners, you can attract them by being a reliable one yourself. There is nothing more important in serious terrain than a fit, trained and skilled partner. The American Institute for Avalanche Research and Education (AIARE) offers a curriculum of three courses to orient skiers to the practices and semantics of avalanche rescue. There are a number of avalanche course providers in New Hampshire, and there is a course practically every weekend all winter long on or around Mt. Washington. As you progress in seriousness, you’ll find yourself on steeper terrain. Skinning on steep terrain isn’t something that comes naturally. You need to focus on your uphill skills much like you focused on your downhill techniques when you first started skiing. 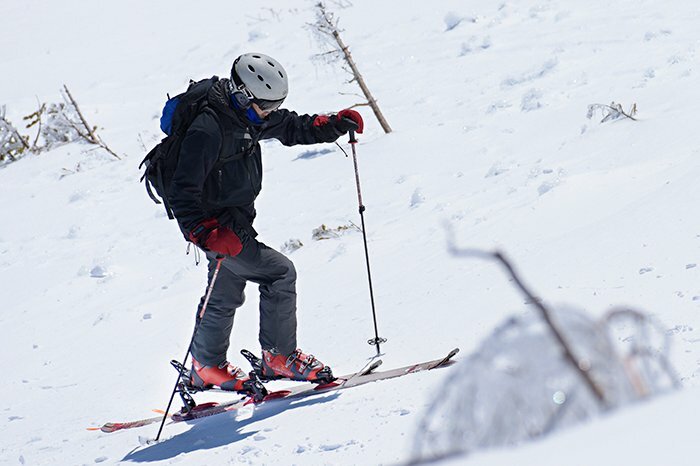 In backcountry skiing, if you aren’t good at going up — even to the point of enjoying it — much of your day will be less than fun. Even the best, fittest skinners will spend 60 to 70 percent of their time going up. Add some inefficiencies, and those percentages go up quickly. Scale can be hard to see in photos. 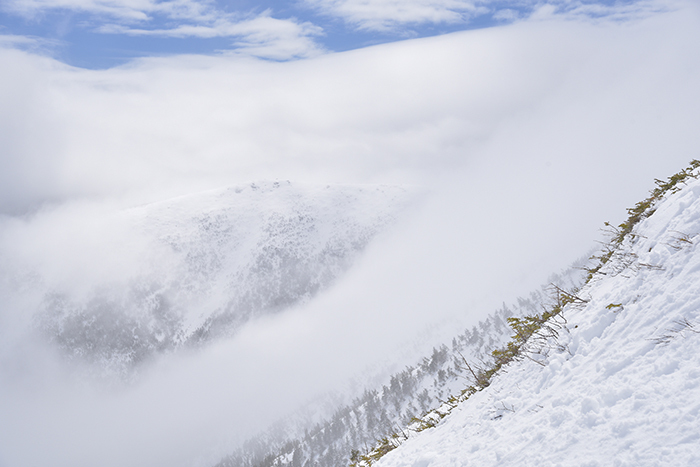 This picture – with one lone person off to the right – gives you a sense of size and steepness. 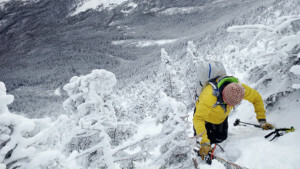 Climbing through and looking at the terrain and snow isn’t just to protect yourself from the avalanche hazard. It makes for better quality skiing. Seeing how the snowpack overlays on the terrain allows you to find the efficient skin line to the top of the run, find the good snow to ski down and helps you manage the avalanche risk. What you’ll find from backcountry skiing is that skiing and riding are really doors into new appreciation of allure of the winter landscape. Getting in touch with a complex, dynamic environment on the way up, and then skiing or riding back down, isn’t about escaping the ski area. It’s about enjoying an awesome slide into the heart and soul of our snowbound wilderness. Marc Chauvin is an expert climber, guide and owner of Chauvin Guides International. With 30 years of experience guiding, Chauvin has climbed everywhere from our own Mt. Washington to the Himalayas. Learn more about his history of guiding, places he's been and his impressive credentials here. He's also the author of "The Mountain Guide Manuel," which is intended for climbers who aspire to climbing more advanced routes. Read more about the book here. Chauvin often works with photographer Jay Philbrick on the latter's cliff photo shoots, which you can learn about below. 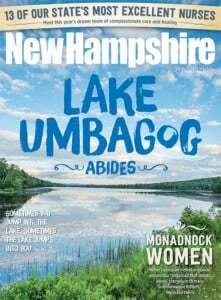 Jay Philbrick of Philbrick Photography is no stranger to New Hampshire Magazine and, specifically, New Hampshire Magazine's Bride. You can learn more about him from our past feature story on his work, at his website or by checking out some of the many gorgeous photo shoots he's participated in for Bride (click here for the latest). Recently, his cliff photos – where newlyweds pose on the side of Cathedral Ledge – made national and international news.